The reversible bridge clip range for ribbon cable. 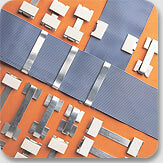 Specifically designed range of clips for use with ribbon cable. 2 self-adhesive areas, acts instantly. Reversible bridge clip supplied flat - can be used flat or formed to suit.